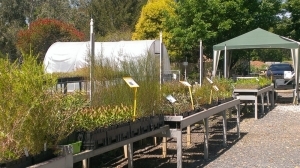 The Riverina Highlands Landcare Nursery provides locally grown native plants for Landcare and community projects and for sale to the general public. The Nursery specialises in growing native plants to suit the region’s local climatic conditions. Ov er 60,000 plants are grown each year, including a range of trees, shrubs, groundcovers, sedges, grasses and climbers. The Nursery is managed by our Nursery Coordinator with the support of a dedicated team of volunteers. More volunteers are always welcome to help with propagating and caring for the plants and grounds. Hear a piece on ABC’s Rural Reporter about the role of volunteers at the Landcare Nursery. The Nursery is located on the Gocup Road Tumut, approximately 300m from the intersection with the Snowy Mountains Highway. The Riverina Highlands Landcare Nursery is supported by very generous volunteers. Opening times may vary due to the need for management to take leave and assist with projects off site. To ensure we can provide the best service for you please contact the nursery by phoning the Nursery Manager on 0427568131.